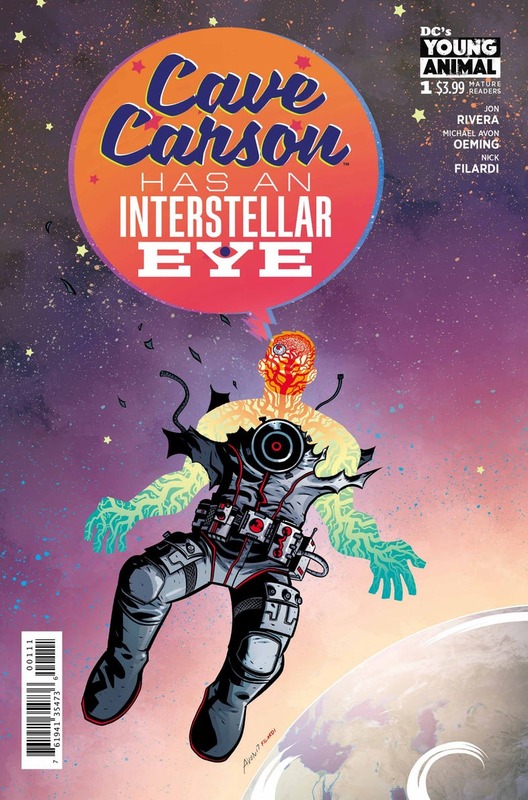 Cave Carson Has an Interstellar Eye #1 Review – AiPT! Cave Carson is on the way to meet intergalactic superstar Star Adam! How does this relate to the black hole opening above Earth? Cave Carson is back. However, his cybernetic eye is now interstellar! With his new upgrade from Milk Wars he’s now able to do much more with his eye, including being able to create pocket dimensions and use the eye as transport (somehow). With his daughter Chloe and the other dimensional version of Marc Bartow he goes to visit galactic superstar sensation Star Adam, who is literally a star. Jon Rivera writes a fun issue setting up the rest of the series with art by Michael Avon Oeming that really fits the tone of the book as always. After a year of multiverse-hopping and fighting in the Milk Wars, returning to a normal life of digging and cave-diving just isn’t the same for explorer Cave Carson. Sure, he’s got his podcast, family and that cybernetic eye, but reminiscing about times gone by isn’t the same as living. Luckily for Cave Carson and his daughter Chloe, they’re about to get sucked into an all-new adventure–literally–when they go spelunking in a black hole! But what’s caused this black hole to appear and what’s its connection to the intergalactic music sensation Star Adam? Cave Carson is one of the best Young Animal titles in my opinion. It is the perfect blend of silver age weirdness with enough normalcy to be accessible. It doesn’t help that the art style is absolutely gorgeous and fits that silver age feel. This issue continues with that trend with how the plot for the arc revolves around them meeting up with intergalactic music sensation Star Adam. The fact that Cave has his own education podcast that Adam watches is even better — it fits the geo-explorer motif while also being completely silly. The dynamics between the main cast is absolutely great and even though characters are just being introduced, the way that they’re written makes it feel like Cave Carson has had his own title before, which unfortunately isn’t true — he guest starred in quite a few series over the years with his last appearance before Young Animal being a small cameo in a page of Final Crisis. This first issue of the series is great and I absolutely recommend trying it out and if you haven’t already read the previous two trades of Cave Carson that are both out now! Cave Carson continues to be fun silver age weirdness with great art to match! The fun silly themes of Cave continue to be written well by Jon Rivera. The artwork of Michael Avon Oeming fit the tone of the book really well. Cave continues to feel like he's been a fleshed out character with his own solo!